"This would be a great way to use leftover Thanksgiving sweet potatoes, but they're even better right on that holiday table with the rest of the feast. By forming and folding dough, we develop beautifully buttery layers and avoid overmixing. These were delicious with the pomegranate spread." Cut sweet potato in half lengthwise. Cut each in half again lengthwise, then in half cross-wise. Cut each piece in half to make about 16 evenly sized chunks. Transfer into pot; cover with water and add salt. Bring to a simmer on high heat; reduce heat to medium-low and cook until potatoes are tender, about 17 minutes. Drain thoroughly; return to pot and mash potatoes. You will need 1 1/2 cups mashed sweet potatoes. Cool thoroughly. Transfer cooled mashed potatoes to a mixing bowl. Add brown sugar and buttermilk. Mix together until well combined. Place self-rising flour in a separate mixing bowl. Grate frozen butter into flour, tossing with a fork to coat with flour after each addition of about 1/3 to 1/2 stick. This will prevent butter from clumping. Mixture should look like floury pieces of butter. Add sweet potato mixture. Toss with a fork until evenly distributed, but don't overmix. Transfer mixture onto a lightly floured work surface. Push and press mixture together into a rectangular shape, about 1 1/2 inches thick. Dough will be floury and a bit crumbly. Fold rectangle into thirds, lifting up one-third and folding onto the middle and doing the same with the other side. Dust with a bit of flour if sticking. Preheat oven to 425 degrees F (220 degrees C). Line a rimmed baking sheet with a silicone mat. Press dough into a rectangle again, about 1 inch thick. Repeat the tri-fold step. Press out into a rectangle, about 1 inch thick. Trim off the rough edges to square off the sides; this will maximize rising. Cut into 8 equal portions. Transfer to prepared baking pan, spacing biscuits evenly. Brush tops lightly with 1 tablespoon melted butter. Bake in preheated oven until browned, 20 to 25 minutes. Cool slightly before serving. Mix 4 tablespoons butter (room temperature), pomegranate syrup, and pomegranate juice together in a small bowl. Spread on warm biscuits. Sprinkle with a few pomegranate seeds for garnish. 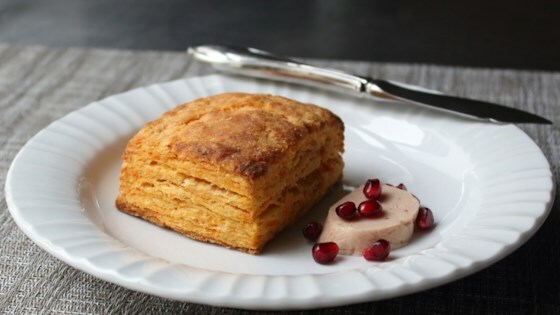 See how to make Chef John's buttery sweet potato biscuits. This recipe makes 8 large or 12 regular-size biscuits. To make your own self-rising flour, mix 3 1/4 cups all purpose flour with 4 1/2 teaspoons baking powder and 1 1/2 teaspoon fine salt. To make your own pomegranate syrup, heat pomegranate juice until it reduces and thickens. Made this recipe as written......it is phenomenal! !